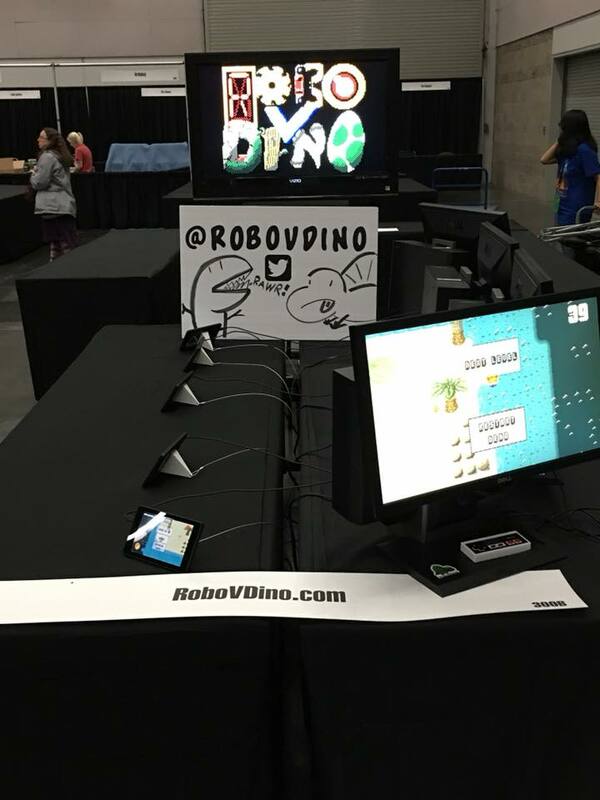 Last month, RoboVDino got a demo at the Portland Retro Gaming Expo. PRGE does have a focus on retro games, but there are always a dozen-ish indie developers showing off their wares at the expo each year (shout outs to Wick's Crescent Loom, Retrotainment's HAUNTED: Halloween '86, and PIGSquad). It's a great place to show off a game and get feedback from lifelong gamers with eclectic tastes, but truthfully, PRGE is my favorite expo and demoing a game I made was a gratifying bonus to going! There's a lot of material out there on how to demonstrate a game at an expo, but I'd like to give a specific breakdown of the prep and costs that went into my little demo and follow that up with a status update on RoboVDino itself. I contacted PRGE staff 6 months before the expo to get a booth. At that time, they were already mostly booked up! 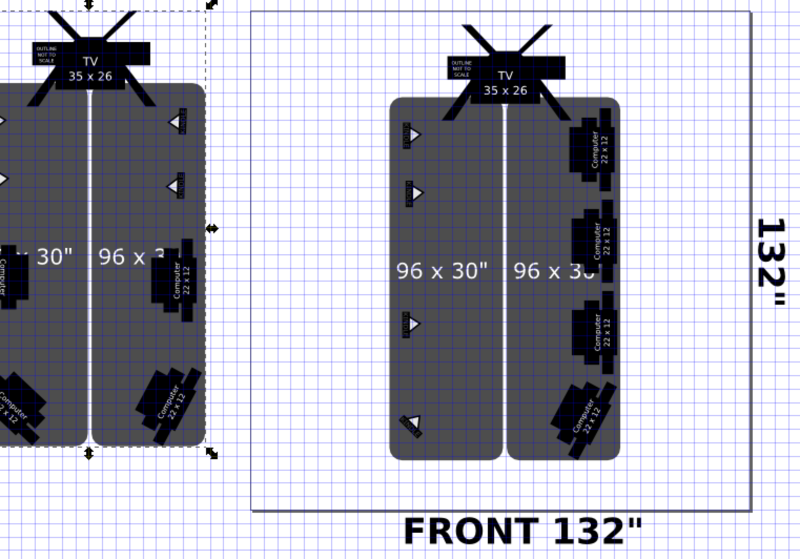 My options were limited to a 11' x 11' booth. I didn't plan on having more than a couple of demo stations, so this was a bit unnerving: nobody wants an empty booth (I made it work... more on that later). Even more unnerving, I was learning Unity so I could switch away from RoboVDino's old engine, and had no functional prototype, but went for it anyway. I opted into squeezing my tables together to let players into my booth and play RoboVDino without having to worry about blocking other passersby. If RoboVDino required a specific platform, my options would have been limited here. Luckily, RoboVDino is a pretty lightweight game, so anything from a smartphone to gaming rig would run it. I ended up showing RoboVDino on Android as well as PC. To demo RoboVDino on Android I purchased 6 refurbished Kindle Fire HD6s from woot.com for $30 each. I speculated "$180 for 6 demo machines is a pretty great deal," and even had a, ultimately not great solution to retain the fires to the table with steel rope and custom made stands epoxied to the backs of the Fires. I used my local library's 3D printer to print the stands I modeled for free, I already owned a bike u-lock to hold the retention equipment, so I only had to buy the fires, a bit of steel rope, a swagging tool, and some little crimps. Though the stands did a good job propping the Kindle Fires up and at an angle, the E6000 epoxy did not provide a strong enough bond and I was able to snap the stands off the Fires with just a little force. In retrospect, the homemade security hardware was likely a waste of time and I can't recommend it. Still, $180 for 6 android tablets to demo with was pretty great. The PCs were an even better buy. My local library had their annual surplus sale to get rid of old equipment. The IT department regularly cycles out old hardware, so I was able to pick up 6 Dell Optiplex 990s complete with 23" 1080P monitors and monitor stands for... $100! That's an absurdly great deal and the computers were perfect for expo use, each one being attached to a stand (with built-in handle!) and only requiring 1 power cord each. You might be thinking screaming deals like that are hard to come by (they are), but school districts, universities, government offices, and even large corporate offices will do surplus sales like this to unload under-loved hardware. Letting friends that work on big campuses know you are looking for surplus sales, signing up for mailing lists with big orgs, or keeping an eye on your newspapers' classifieds can clue you in to when a surplus sales happen. The machines didn't come with operating systems, so I installed Ubuntu 16.04 (free). I needed some controllers to play RoboVDino and settled on a batch of cheap USB NES-like gamepads for less than $20. I liked the gamepads so much, I wrote a review on them! Signage can be really expensive and doesn't really have a lot of usefulness after an event. Worse, my presskit for RoboVDino, even 3 weeks after PRGE, doesn't have a lot of content. My best piece of art in the presskit is an animated gif, something that wouldn't translate well to a vinyl sign. So, I opted for digital signage. I had an old 32" 720P television, so I paired it up with a cheap AV cart for $65 and one of the computers I bought in the surplus sale. I made a 720P version of RoboVDino's animated logo, and scripted the machine to show the logo full screen on boot. In addition to the digital signage, I wanted to take advantage of the floor space. I have one of the infamous inflatable t-rex costumes I used in the first trailer of RoboVDino, so I wanted to put it to use at the expo to drive traffic toward my booth. My excellent wife and partner, Jamie, agreed to help out by wandering around the expo with a huge sign to drive people my way! The sign was easy to make, keeping with the twee aesthetic of RoboVDino's advertising, I opted into a hand-drawn sign on a piece of foamboard from a local dollar store. I already owned the costume, but they can be purchased for less than $100. I spent a long time agonizing over business cards, stickers, and promotional merchandise. What I decided was right for me was recognition of the name "RoboVDino" since there is a robovdino.com, @robovdino on twitter, RoboVDino on Itch, and a RoboVDino on Steam. 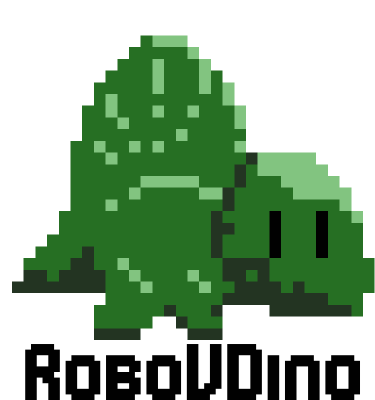 I settled on stickers with a simple design of the dimetrodon from RoboVDino with "RoboVDino" written underneath. It was simple and people enjoyed the design on its own merits, something critical to getting somebody to actually stick a sticker to something. StickerGiant was able to print 1000 stickers for less than $150. Jamie and I ended up giving out about 800 stickers at the expo. Additionally, I wanted t-shirts for Jamie and I while we were at the booth. I used the same design as the stickers for our t-shirts and submitted an order to CustomInk for two shirts at $72. At $36/shirt, even for the high quality shirts we chose to print the design on, it was an expensive choice, but I don't regret it. Having a comfortable shirt to wear after the expo with this design has given me several opportunities to pitch RoboVDino to folks that thought the design was cute (especially when I could give them one of my leftover stickers!). A cringeworthy fact of game demos shown at expos is they're usually a bit of a facade. They may well represent the final product, but they're often builds walling off unfinished areas and features, entire modes of play are disabled, or assets in the game are not quite as polished as they should be. A facade was exactly what I demoed at PRGE! 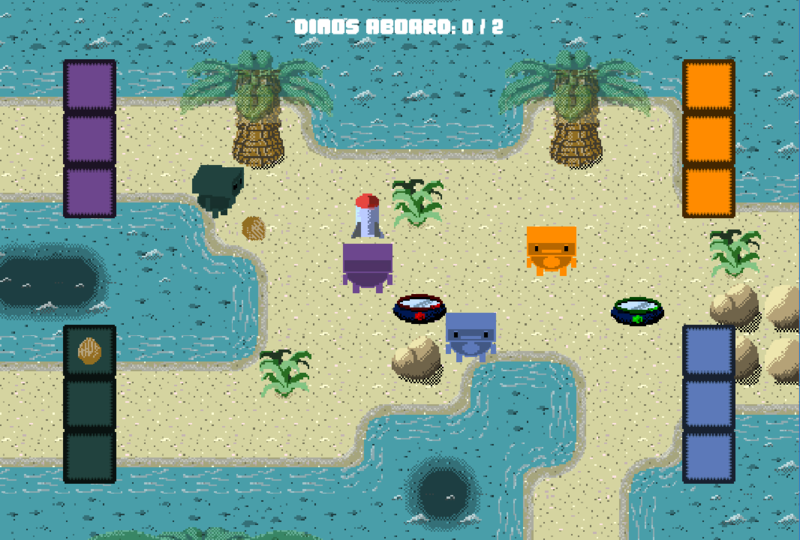 I limited the demo to just the Dimetrodon and T-rex, the only weapons were coconuts, rockets, and throwing one dino at another, and just 6 short levels. I hoped that this would be enough since it had to be enough. I needed something to understand how the game appealed to a wide swath of players and understand what a random first time player would experience. All the shortcuts and bandaid fixes I applied resulted in racking up a lot of tech debt in "FIXME" and "TODO" comments throughout the game code, but the feedback I received from demoing RoboVDino in this state more than made up for any poor design decisions I made to shove a demo out the door (more on this later). Aside from the mailing list signup sheets, demo hardware, signage, t-rex costume, and swag, I brought refillable water bottles, a massive, 12 plug surge protector, a 50' extension cord, and a bunch of snacks. I lucked out and had most of these materials on hand, so there really wasn't a cost associated with a survival kit for me. Still, I strongly encourage checking out Indie Boothcraft for some tips on making survival kit checklists. More than half of the costs are for equipment that I can easily reuse for the next expo I show RoboVDino at, but I could have definitely cut some corners. Will there be a return on this investment? I plan on updating this post after RoboVDino's release and postmortem. I eluded to this earlier, but the feedback I got from players was so awesome, it made up for anything I could consider going poorly. If I want to try spinning something as bad news, it's probably that the mobile version of RoboVDino's controls, while sufficient, didn't impress players nearly as much as the PC version of the game with a gamepad. Still, demoing RoboVDino on mobile devices made me realize I need to prioritize the PC release of RoboVDino and then move return to the mobile release when I can spend more time on making that experience feel just as good as its PC counterpart. Buffs that affect speed, throwing distance, power, etc. The most commonly requested feature was a cooperative play mode, which leads me to an update on RoboVDino itself: I am prototyping local coop!